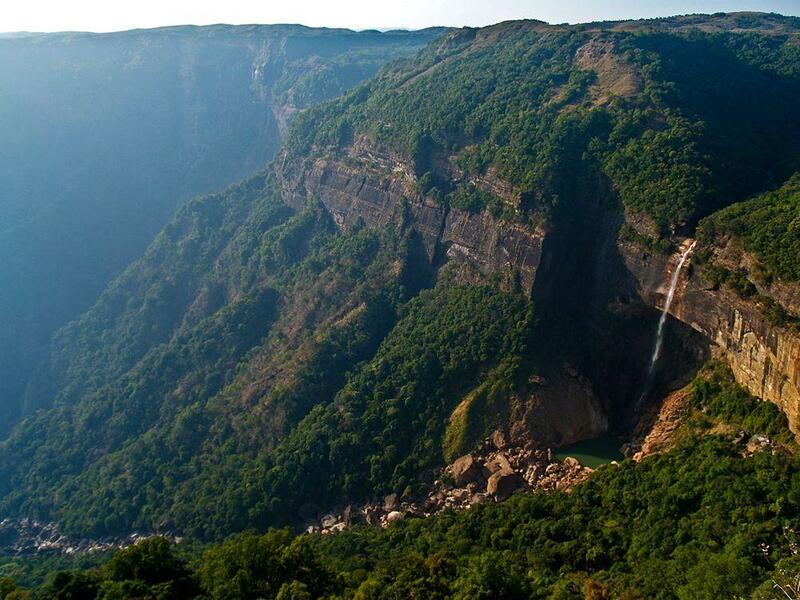 One of the tallest and certainly – some of the most beautiful falls in India are Nohkalikai Falls. Water here falls in a single plunge which is approximately 335 m high. Stream forming these falls is short – a bit more than 2 kilometers, water is collected from the fairly small plateau around Sohra village. In other locations of the world in similar geography would form just a small stream. 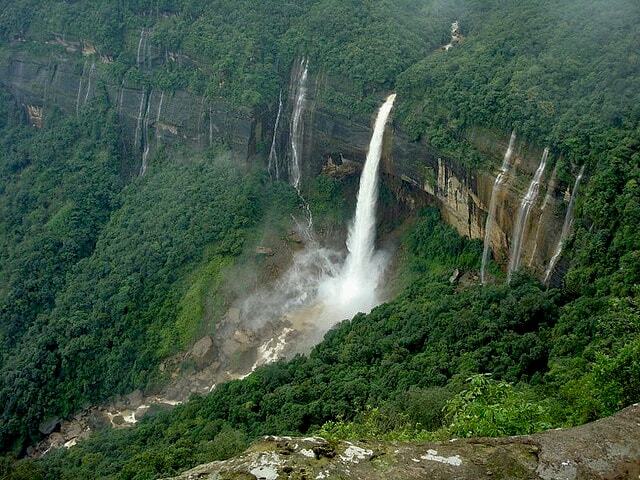 But Nohkalikai Falls is falling from very special plateau – one of the rainiest places in the world mentioned in almost every geography schoolbook around the world – Cherrapunji. Plateau around Cherrapunji (Sohra) town is almost barren and in winter it can become quite dry (and cold). But in summer, as the moist monsoon winds from the endless plains of Bangladesh and Bengal Bay start blowing towards Tibet, they meet sudden obstacle – steep Khasi Hills. As a result here are experienced downpours of fantastic intensity. In Cherrapunji in one day (on June 15-16, 1995) even rained 1,563 mm (three times more than in London PER YEAR). As a result, the beautiful Khasi Hills are adorned with ribbons of countless waterfalls and Nohkalikai Falls belong to the most impressive ones. Nohkalikai Falls is formed by a powerful (during the rains) stream. 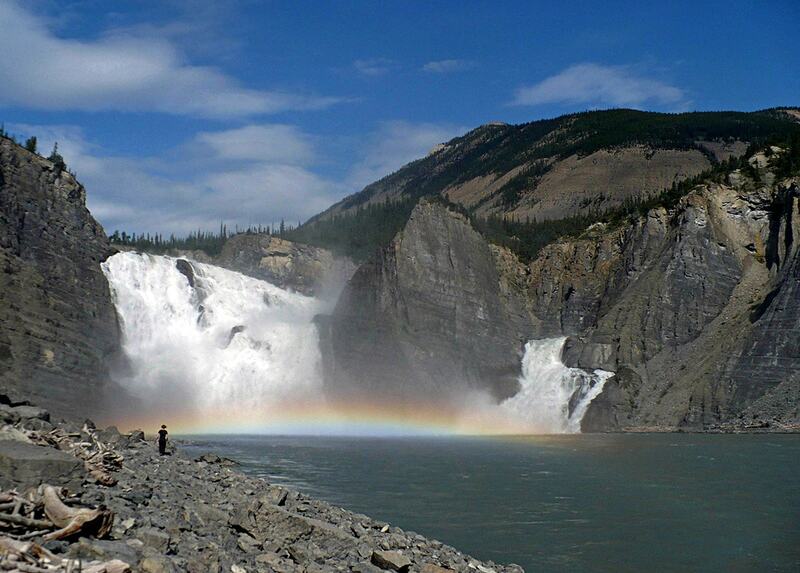 The waterfall falls in a single plunge over Cretaceous – Paleogene sandstones and limestones. Upper part of falls flow along nearly vertical cliff but for some two-thirds falls are free falling – there has formed giant grotto behind the falls. In the rainy season it might be fairly complicated to take a good picture of falls, as fog and clouds are frequent. As the rains end and falls become thinner, there opens a view to another gem of Nohkalikai Falls – beautiful green pool at the base of falls. Likai ("Ka" means "women") lived in Rangjirteh village (former village some three kilometers north – northwest from the falls). Her first husband died while at work and she was left alone with her baby girl. Her woman friends persuaded her that she should marry once again – so did she. Unfortunately her second husband was extremely jealous of the small girl – Likai loved the girl more than husband. One day as Likai was at her hard work, her husband did a terrible thing – murdered girl, chopped in pieces and made a soup of her flesh. The fingers were thrown in betel basket. Likai returned from her work – but nobody was home. At first, she was not worried about the girl – neighbors often took good care of her. Likai found soup and ate it. After the meal she, as usual, looked for some betel… and to her horror, she found fingers of her child. As Likai realized what she was eating for dinner, she became insane of horror and grief. She started to ran through the village until she reached the precipice and threw herself down. Some tourists call the smaller fall some 50 m west from the main fall – a daughter. Rangjyrteh Village is not above the falls. Its quite far actually, and the village even though not active anymore, is ruins still remains. Rangjyrteh is close to Dainthlen falls. Thanks! Had to look at local geography once again. Hope it is more correct now!